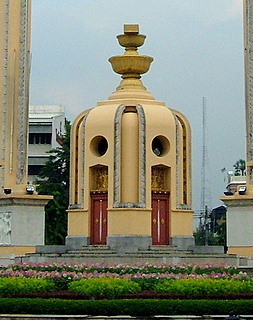 The Democracy Monument in Ratchadamnoen Avenue was erected in 1939 to commemorate the 24 June 1932 coup. That was the year when the People's Party led by Pridi Banomyong and the military faction under Phibun Songkhram staged a coup that changed the face of Thai politics for years to come. The 150-year-old absolute monarchy came to an end and Thailand changed to a constitutional government. It was an Italian artist and sculptor, Corrado Feroci who designed the Democracy Monument with a symbolism to capture the spirit of the occasion. The monument has four curved columns arching inwards. 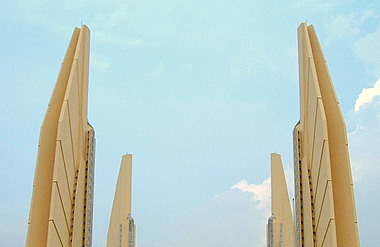 Each column is 24 m in height to signify 24 June, the date of the revolution.The winged-shaped columns signify the freedom and rights of the people. There is a protective ring of 75 cannons at the base of the monument to symbolize the Buddhist year of the revolution 2475. The ring of cannon is not there anymore. The original 1932 constitution is kept in a pedestal at the center of the four columns. The six swords on each of the doors in the pedestal represent the six major policies of the Peoples' Party. Owing to its emotional appeal, this monument has been a natural rallying point for democracy movements and demonstrations throughout Thai political history. In October 1973, one such demonstration took place before the Democracy Monument. It was a massive groundswell of public protest against the military dictatorship of Field Marshall Thanom Kittikachorn and to demand the release of 13 students arrested by the military. Organized by students of Thammasat University with tremendous public support, the demonstrators numbered almost 200,000, the biggest in Thai history. In the days that followed, tensions soared. On 14 October 1973 the military moved in to disperse the demonstrators forcibly with tragic consequences. As a result, the government collapsed and Field Marshall Thanom had to leave the country. The traumatic impact of 14 October 1973 on Thai society is vividly described in Salisa Pinkayan's historical novel, Chalida. It's also no coincidence that there are hardly any books giving an account of what actually happened. Further along Ratchadamnoen Avenue is the 14 October 1973 Memorial a monument dedicated to those who made the supreme sacrifice, brave young men and women who stood up and died for a cause. Unfortunately, Field Marshall Thanom returned to Thailand three years later and in that ill-fated month of October, history was to repeat itself. On 6 October 1976 the military and right wing groups stormed Thammasat University where students were gathered to protest the return of the Field Marshall. In the brutal crackdown that ensued, more lives were lost. Later in May 1992, the monument in Ratchadamnoen Avenue was to witness further carnage. General Suchinda Kraprayoon, who seized power through a coup a year earlier, reneged on a promise not to be Prime Minister. Widespread protests mounted, the demonstrators rallied again and another disaster was impending. In what became known as Black May 1992 another tragedy was added to Thai political history. General Suchinda left office after a royal rebuke televised live nation wide. For more on the coups in Bangkok. Read about the latest coup, the 2006 coup in Bangkok. At the height of the military crackdown, several demonstrators fled for their lives and sought refuge in a nearby hotel in Ratchadamnoen Avenue near Sanam Luang, the Royal Field. The hotel hid them, fed them and gave them staff uniforms and passes to get past the military checkpoints the next day. That magnanimous act was to save their lives and the hotel where they sought refuge, the Royal Rattanakosin Hotel won the hearts of the democracy movement and took its place in history. In the two decades from 1973 – 1992, the area around the Democracy Monument has witnessed three major upheavals resulting in bloodshed. It is hoped that there would be no more. Today, the Democracy Monument stands in a peaceful Ratchadamnoen Avenue, a silent sentinel of freedom, in the Land of the Free. 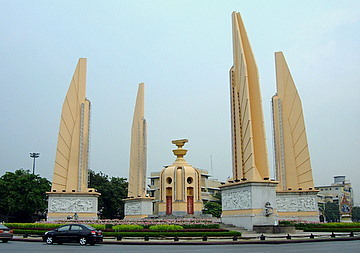 The Democracy Monument is situated at the roundabout that is at the junction of Ratchadamdoen Avenue and Din So Road. 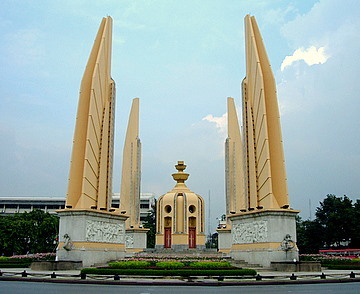 The monument is located at the mid-point between the Grand Palace and Dusit Garden. The air-conditioned bus service number 79 from Pratunam (bus stop in front of the Grand Diamond Pratunam Hotel) will take you to Ratchadamnoen Avenue and the monument.